Here's an interesting article, although ultimately wrong. The author's opinion of atheists might seem to reflect some of my views, above, on a certain class of atheists, but he throws out the baby with the bathwater, and completely misses the point, in a typically theistic way, to whit, "If you don't have my particular [and factually incorrect] overarching view of the world, they you have no big-picture view at all." 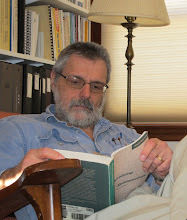 There is no rationale, for example, for equating atheism with " individualism and relativism" or to assume that questions of ethics and morality are immune to scientific and philosophical inquiry, absent a divine being, or especially that there are currently no atheist scientists and philosophers attempting such inquiries. Plus, his blaming the violence and war of the 20th Century on a flight from god willfully ignores the violence, war, and religious persecution of the Middle Ages, to say nothing of the 16th and 17th Centuries.